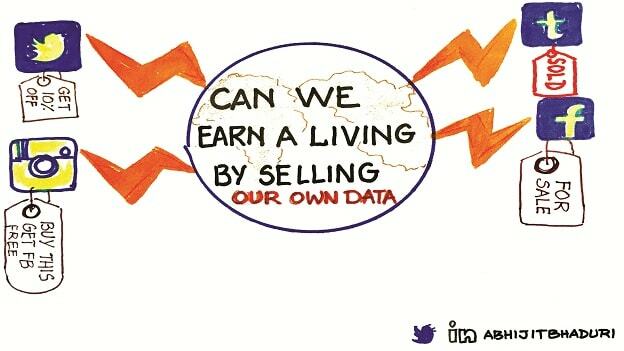 Blog: Sell your data and make a living! If robots take away our jobs, will selling our own data the next method by which we will make money? This was the answer that a bank robber Willie Sutton (1901-1980) gave when asked the question, “Why did you rob the bank?” Sutton reportedly made over $2 million in the course of his many robberies and was on the Ten Most Wanted list of the FBI. He used to change his disguise every time. Sometimes he came dressed as a policeman, a window washer, a maintenance man or even a bank guard. But that was in the analog world. In the digital world, the likes of Willie Sutton have proliferated. They are called hackers or cybercriminals. The browser and not the bank is where we deposit the stuff that is more precious than money – our data. The analog world was all about mass production. It offered economies of scale. Choice was limited. We lived in a world of scarcity. Every house had the same brands. We watched the same television channel, heard the same radio station. It was a black and white world. You either had what many others had or you didn’t. The goods were the same; and people had to fit in. The digital world is different in every way. It is an age of abundance. There are seven billion versions of every product or service – one for every person in the world. There are multiple ingredients offered and we pick what we like and create our own cocktail. Individuality is celebrated. Every member of the family is different. It is this celebration of the individual that is the foundation of the digital world. The only way the producers make money is when they are able to create their products for a market of one. That is why data is so precious. It is basis of all individualization. That is where the money is. That is where the modern day Willie Sutton will be found. You are being watched – all the time! When we install any software, it presents us with a legalese filled End User License Agreement. The Windows Operating System agreement has 5268 words. None of us really read it before we press “I agree” and get on with the task. Websites ask for your permission to install “cookies” to track your web surfing habits. Go to your phone settings and you will be shocked how many apps have access to your phone’s camera, microphone and geo-location. All the permissions have been given by you. Hence, we have all agreed to being tracked. Google is a company that sells the data it collects from all the “free” services like YouTube (just one of its free services) where people watch a billion hours of videos every day. Data of a billion kilometers of navigation is collected through Google Maps. Google’s search engine knows just what you looked for. 500 million users upload 1.2 billion photos every day on Google Photos. 800 million users upload 3 billion objects every week on Google Drive. When you connect the data that is generated through each of these services, an awful lot about you is known. This data can now be sold for targeted ads. Not just what to sell! The Internet Service Provider (ISP) knows every site you visited and every page you looked at. So does your web browser. This can reveal everything from your political views to your sexual orientation. This can be used to personalize the ads that you watch. The ads act like nudges that will help companies sell us more stuff. But so can the governments. The data we generate is then used to craft algorithms that can predict our next move. That is the basis of all the nudges we get as we shop. “Those who bought X also bought Y” is the algorithm trying to figure out your next move. The algorithms are always trying to second guess you — till the time you give up controls of your life to the algorithm. It is not just what is being collected and sold to advertisers. Every time there is a data breach, your data lands up with someone you may not want to be associated with. Government backed hackers, underworld, terrorist organizations and much more land up grabbing a slice of your data without your knowledge. People donate their kidneys and get paid. Surrogate mothers get paid. Why don’t we get paid in the new currency? — Our own data. Instead of giving it away for free, we can now take control over what data is being collected about us and how we can be paid for it. A new marketplace is springing up where you can profit from your own data. In the UK, Citizenme collects your data and gives you a peek into how an advertiser will categorize you. Once you install the ad and connect your Facebook, Twitter and LinkedIn accounts, you will see the data that is generated by you and how the advertisers will use your profile. Then you can anonymize it and sell it. They become like your authorized agent for selling your data. Your data has value. Citizenme helps you exchange your personal data for cash rewards anonymously with businesses. Your data will only be used for research purposes. The best thing is you get paid cash instantly into your PayPal account. No minimum usage required. They want to be ones to sell the digital footprints you leave behind. They want to be your sole agents. If robots take away our jobs, will this be the next method by which we will make money? Maybe the world will be divided into two or three major players and we will decide which data market we wish to sign up for. Every time we surf, we will be depositing some cash in our bank account. That will be the new definition of work and pay. NEXT STORY: The fall and rise of polyvalent: Are you one of them?